DETERMINED: Sheffield Steelers' head coach Paul Thompson hopes to return from South Wales with the Challenge Cup. Picture: Dean Woolley. WHILE the white flags are nowhere near to being raised in the surrender of their Elite League crown, there seems to be a growing realisation that it is going to require something pretty spectacular for Sheffield Steelers to secure a sixth regular season title. After leaders Cardiff Devils won 4-2 at Manchester Storm last night, the Steelers find themselves 10 points adrift of their South Wales rivals with just seven league games remaining. They do have a game in hand and two of those seven games come against the Devils in the space of seven days, with Andrew Lord’s side first visiting South Yorkshire on Sunday, March 12. And while there may well be more twists and turns to come in the title race, the current situation in the standings certainly makes tomorrow’s meeting between the two sides in the Challenge Cup Final more meaningful, particularly for the Steelers who head to Ice Arena Wales having never won the competition in the EIHL era. Their last appearance in the final saw them beaten 2-1 by the Devils at Sheffield Arena two years ago. Five times Paul Thompson’s team have visited Cardiff this season, twice they have emerged victorious – a 5-4 Challenge Cup group win back in October preceding three defeats by the odd goal before the Steelers rediscovered the joy of winning at the venue with a 4-3 win on January 22. With home advantage, Cardiff will go into the tie as favourites, but the Steelers have plenty of reason to go into the showdown in confident mood, as well as being given additional motivation to deny the Devils in their own building. That stems from when Cardiff opposed Steelers’ plans to move tonight’s league clash against Coventry Blaze at Sheffield Arena to last Wednesday, Thompson understandably wanting to give his players more time to recover for tomorrow’s final. But, much to the Steelers’ frustration and despite Coventry being happy to oblige, Cardiff objected, citing a league rule which meant the fixture could not be moved within a four-week period of the original fixture date. If nothing else, it will surely add a little extra spice to Sunday afternoon’s encounter. “It would be nice to go down there and bring this trophy back for the club for the first time,” said Steelers’ head coach Thompson. ENJOY IT: Sheffield Steelers' captain, Jonathan Phillips. Picture: Dean Woolley. “We’re going to have a lot of fans down there hoping that we can do that. “Every time we’ve played down there this season they have been barnstorming games, some absolutely fantastic hockey games and the final will be no different. “Make no mistake, we fully respect Cardiff as a hockey club – their team, their club and the way that they play. “But we’re in the Challenge Cup final up against a team that has used something to gain an advantage. Every time we’ve played down there this season they have been barnstorming games, some absolutely fantastic hockey games and the final will be no different. “It’s a Cup final and the first bit of silverware up for grabs this season, so I would hope we’re absolutely motivated to win,” he added. 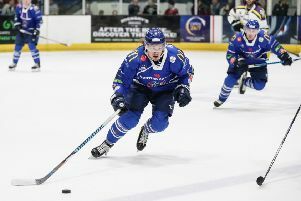 Thompson will be hoping to have Swedish centre Andreas Valdix back in the line-up on Sunday, with fellow forward Robert Dowd – who also missed the Fife defeat through injury – expected to return. In reality, despite being denied the chance to have some welcome rest ahead of tomorrow’s final, playing back-to-back games should prove no problem for the Steelers, given it is what they do virtually every single weekend of the season. It is an opinion shared by Steelers’ captain Jonathan Phillips, who has been urging his team-mates to simply enjoy the occasion in South Wales. “We’ve been enjoying this week, you can’t panic about these things or stress too much about it,” said Phillips..
“It is a Cup final and you’ve got to embrace it and enjoy it because it is a fun situation to be in and you don’t know when the next chance to be involved in one is going to come. “We’ve played well every single time we’ve been down there and we’ve won twice, so we’re rightly confident about what we can achieve. “It is the first of the three major trophies to win in our season and we want to make sure we finally get our hands on it,” he added.